New York: Executives at Citigroup Inc., faced with a plunging stock price, began weighing the possibility of auctioning off pieces of the financial giant or even selling the company outright, according to people familiar with the matter. The internal discussions are at a preliminary stage and don’t signal that Citigroup’s board and management are backing down from their insistence that the New York company has ample capital, funding and strategic direction, these people said. But with the stock down another 26% on Thursday, its worst one-day percentage decline ever, Citigroup officials have decided they need to reckon with a range of scenarios that were unthinkable only weeks ago. In early trading on Friday in New York, Citi shares were trading at $4.56 (Rs228). Citigroup’s board of directors was scheduled to have a formal meeting on Friday in the US to discuss the options, according to people familiar with the situation. The directors have also been talking by phone about what could be done to reverse the stock’s slide. Top executives were locked in meetings on Thursday to hash out a stabilization strategy. 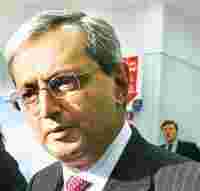 Meanwhile, chief executive Vikram Pandit had scheduled a conference call for 8am on Friday to discuss the situation with senior managers. A Citigroup spokeswoman said in a statement on Thursday evening: “Citi has a very strong capital and liquidity position" and is “focused on executing our strategy", which includes cutting expenses and selling assets. “We believe the benefits will be seen over time." With roots stretching back to 1812 and more than 200 million customer accounts in 106 countries, Citigroup is an icon of global capitalism. It is getting battered by the same financial storm that has already remade the face of Wall Street, forcing the sale of Bear Stearns Companies Inc. and Merrill Lynch and Co. earlier this year, and triggering the bankruptcy filing of Lehman Brothers Holdings Inc. Weighing down the shares has been the US treasury department’s decision last week not to buy troubled assets from banks. Citigroup’s balance sheet includes battered securities and loans that many investors hoped could be offloaded to the government. JPMorgan Chase and Co. shares slid 18% on Thursday, while Bank of America Corp. fell 14%. Citigroup fell $1.69 to $4.71 in New York Stock Exchange composite trading on Thursday. In early trading on Friday, JPMorgan was trading at $21.82, while Bank of America shares were at $11.28. In Washington, Citigroup officials this week have been urging lawmakers and regulators to intervene by making it tougher for investors to place bets that the company’s share price will fall, a strategy known as “short selling", according to people familiar with the matter. The firm, along with representatives of other banks, is lobbying the Securities and Exchange Commission (SEC) to reinstate the ban it temporarily imposed this autumn on short selling of financial stocks, the people said. SEC chairman Christopher Cox said he would hold a teleconference with international regulators on Monday to discuss short selling and other matters. In a statement, he said it was essential that “there be close coordination among international markets to avoid regulatory gaps and unintended consequences". Meanwhile, Citigroup executives and directors are rushing to bolster the confidence of investors, clients and employees. Members of the board are hoping that Citigroup can weather the storm by becoming more transparent with investors and easing anxiety that tens of billions of dollars in risky assets are lurking on the company’s books. On Wednesday, in one move aimed at quelling the uncertainty about Citigroup’s exposure to risk, the company said it would buy $17.4 billion in assets from its structured investment vehicles complex investment tools that first encountered trouble last year due to their mortgage related holdings. Executives have been telling traders, brokers and other employees to reach out to clients and tick off a list of factors that showcase Citigroup’s strength. On Thursday, for instance, executives in the wealth management unit arranged a Friday afternoon conference call for clients. A brochure that brokers were asked to share with clients promises that the call “will help you to better understand the current financial crisis". The sell-off in Citigroup shares has led executives to start laying out possible contingency plans. In addition to pondering a move to sell the entire company to another bank, executives have started exploring the possibility of selling off parts of the firm, including the Smith Barney retail brokerage, the global credit card division and the transaction services unit, the people said. Pandit is loath to pursue such an approach, they added. Thursday’s stock slide came despite the announcement by Saudi Arabian investor Prince Alwaleed bin Talal bin Abdulaziz Al Saud that he will increase his holdings in Citigroup Inc. to 5%, adding that he supports the banking giant’s management. “Prince Alwaleed began buying Citi shares as he strongly believes that they are dramatically undervalued," according to an emailed statement from his office. His holdings are less than 4%, according to the statement. In late September, hoping to deepen its pool of deposits and shed some risky assets, Citigroup agreed to buy Wachovia Corp. with backing from the US government. But before the two banks could hammer out a formal merger document, Wells Fargo and Co. swooped in with a higher bid, stunning Citigroup executives. The Wachovia debacle turned out to be a turning point for Citigroup. The deal’s unravelling highlighted the paucity of other options for the firm to pursue in an era when many banks are merging in order to survive. Few other banks that Citigroup can afford to buy would bring similar levels of deposits, the lifeblood of banks. In recent weeks, Citigroup has been negotiating a possible acquisition of Chevy Chase Bank, which is a fraction of Wachovia’s size, according to people familiar with the matter. With Citigroup’s stock declining, the Chevy Chase deal is now in danger of falling apart, the people said, because Citigroup had hoped to pay for the acquisition in stock instead of cash. Other bidders include Capital One Financial Corp., BB&T Corp., JPMorgan Chase and Co. and SunTrust Banks Inc., the people said. Citigroup executives are also weighing the possibility of selling the company or merging with a rival. Some analysts have pointed to Morgan Stanley and Goldman Sachs Group Inc. as potential suitors. In the case of Morgan, Pandit spent most of his career there and still keeps in touch with Morgan executives, including CEO John Mack. But people familiar with the matter said that Morgan wasn’t weighing a bid and hadn’t spoken to Citigroup about a deal recently. Morgan and Citigroup held preliminary discussions about a merger in September when Morgan Stanley shares were under intense pressure. Morgan covets the bank deposits and the added brokerage business that Citigroup would bring, but Morgan would mainly bring to Citigroup an investment bank that greatly overlaps with its own business. Goldman Sachs is in much the same situation. It, too, would potentially look at pieces of Citigroup. But buying the entire company, and the liabilities that come with it, would be a lot to bite off. Rob Curran, Dan Fitzpatrick, Aaron Lucchetti and Robin Sidel contributed to this story.